Several things come together in this post, combining medieval history, TV history, current events and the proper scale of historical analysis. 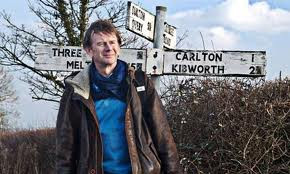 I was watching Michael Wood (still, by a country mile, the best of the TV historians) with his Story of England, which reached the Barons’ Revolt and discussed the way in which (it was claimed) it affected the ‘ordinary person’. We were given a hint of a sense of change for the better, of hope: a sense of change and hope that, alas, ran up against one of the most talented military commanders of the Middle Ages (a low bar, admittedly) – and one of the most brutal – in the form the Lord Edward, the future Edward I. The hopes faded just as, over time, pilgrimages to the spot where Simon de Montfort (a funny sort of revolutionary...) got hacked to bits gradually died away. In the Whig historical view, this is all a step on the road to parliamentary democracy. That way of seeing history is rightly unfashionable, of course, but I still detected a sense that we were supposed to envisage in the events of the 1260s some sort of progress towards a (politically, socially) better or fairer place. Clearly that sort of view is only possible with hindsight, but it is also only possible when viewed from a particular historical vantage-point. Seen in, say 1350, I imagine that one could hardly view it in such terms at all. If it was part of a grand narrative then, presumably, it was as a blip on the march to better, more powerful Plantagenet kingship. (I’m guessing, here, obviously, but you see my general point.) It may well be that in twenty years’ time, unless we are all very careful, it might look different, too. This line of thought took me on to ponder other issues. One is something that I have often wondered, in a form of empathy (something else that’s unfashionable): what is it like, historically, to know that ‘that’s it; we lost; end of story’? To know that something you fought for and believed in is gone for good. It is of course a sensation cheapened (with apologies to Bill Shankly) by pictures of unpleasant, overpaid idiots like John Terry weeping because he couldn’t hit a goal-sized target, or supposedly broken-hearted fans whose team just lost a cup-final. They can try again next year and win ... and with no more lasting effect or significance. What I am talking about is something marked by an awful finality. What, for example, did it feel like to be Napoleon I (or one of his soldiers) on the evening of Waterloo, and know that, truly, that was that? What does it feel like to experience one of the real ’full stops’ of history? Such moments are rare in history. It is not often that one can know for sure that the historical ‘game’ really is over, that that really is it, and we lost. This issue matters to me for a number of reasons. It has especially important, immediate contemporary resonance, to which I will return. It also matters because of the scale of historical analysis. On the very first pages of my first book* I argued against the longue durée proposed long ago by the Annalistes, essentially on the grounds that it ironed out the twists and turns of history and in so doing removed individual experience from the analysis. Since the human lifetime is the only framework within which we experience history (if we experience it at all, which is another issue) then it seemed to me that this is the only meaningful framework of analysis. To take an example I used in Barbarian Migrations..., the whole political arrangement of Europe that followed the Second World War, the Iron Curtain, etc., lasted barely two generations. From a geopolitical longue durée perspective, this can be seen as a simple blip. Forty-five years later the map had changed back to something resembling the map before 1939. But for those forty-odd years this arrangement had an enormous effect on the daily lives of millions, which the historian should not deny. In particular the danger (for historians in, say 300 years’ time) would be to play down the horrors of the Second World War on the grounds that the war had little or no long-term effect. More to the point, as concerns me today, the teleology of the longue durée takes short-term sets of events and experiences, like the common man’s involvement in the baronial reform movement (by the way, I’m not trying to claim the Barons’ Revolt really was some sort of democratic revolution; it is just a suitable example to use for this thought-exercise) and turns them either into blips or dead-ends or ‘steps’ on the road to a major change, depending upon how the course of history is interpreted from a particular vantage point. Both are mistaken ways of seeing. That the common freeman of Leicestershire, hit by the royalist backlash after Evesham, drew no comfort from the fact that ‘only’ 400 years later Parliament would overthrow and behead a king, and introduce a constitutional monarchy, goes without saying. To turn his and his allies’ efforts into a dead-end or a blip because they failed is similarly teleological. The triumphalist grand narrative denies the pain and anguish of lived experience; the ‘dead end’ approach denies us hope. Indeed, maybe it is intended to deny us hope: don’t try and challenge the natural, the ‘right’ order of things. “History tells us …” How often do we hear that phrase? But history tells us nothing of the sort. Ever. So they failed. Try again (as Žižek is fond of quoting); fail again; fail better. The approach rules out (as I have also argued before) the irony of history. It leads us to the absurdities of, to take just one egregious example, Peter Heather’s arguments that ‘The Goths’ were a people with a coherent set of aims (on the basis that at some later point, some people called Goths ended up with a kingdom within what had been the Roman Empire). In the hundred years preceding the deposition of the emperor Romulus in 476 it is well-nigh impossible to identify anyone who was actually trying to bring down the Roman Empire, rather than trying to re-establish the imperial political system of the fourth century, with them in a controlling position. A great deal of the history of the creation of what we see as the new political and social world of the ‘Middle Ages’ is in fact the history of people trying to recreate the Roman Empire. Napoleon may have realised that the game was up late in the evening of June 18th 1815 but when he signed the Treaty of Tilsit a few years earlier, or when he married Maria Louisa of Austria, or when his son was born, he and his followers can be forgiven for thinking that he (and they) had won. What interests me about the generations around 600 is that the motor for change, as it appears to me at the moment at any rate, is an awareness that they were living through a new phase: that the old world of Rome had gone (note that it had taken the best part of a century after Romulus’ deposition, and some fairly horrible wars, to establish this point). They were trying to figure out how to respond to this, new situation, with (naturally, but perhaps more obviously than usual) little idea of where they were going. You might well have guessed where I am going with these meandering thoughts. It looks to me that we are at a point where those of us on the Left might well think that the game is up, that that’s it, we lost. If we can draw lessons from the way we think about history, though, I think we might make several important points. One is that many people do not seem (surely?) to realise the implications of what is happening, so there is still a battle to be fought and won. Another is that the game isn’t up yet; or rather that it only is if we give up on it. Cameron and his order-paper-waving right-wingers may think they have won, and that they can go ahead and dismantle the welfare state, and sell its opportunities off to themselves and their chums in the private sector (in effect returning us to a 21st-century form of feudalism) but they can be stopped. And they must be stopped. But that is down to all of us. The alternative is that everything – every little change, every little baby-step, to improve the lot of the ordinary person – that people have fought and died for over the past seven and a half centuries becomes a dead-end, a curious blip that right-wing historians will be able to point to as showing the futility of challenging the ‘natural’ order. Every backlash against fairness, every move against the Welfare State, the National Health Service, free education and so on, will be made into a step on the road of Progress. Is that the history we want to bequeath to future generations? If we work hard, this may not be the Waterloo of the Welfare State but the Ligny** of the Right. The alternative is not worth thinking about. It’s not over yet, and (to return to my earlier metaphor) David Cameron is no Lord Edward. ** For those less interested in Napoleonic military history than I am, the battle of Ligny was Napoleon’s last victory, fought two days before Waterloo. Napoleon, it has to be said, played a blinder in the Waterloo campaign up until the battle itself. Such is the irony of history.